**Disclosure: We thank Wilmington for providing us with a complimentary tour in order to facilitate this review. No compensation was received. All opinions are 100% our own. We continued our day in Wilmington, North Carolina by reveling in the splendors of the historic district during a delightful horse-drawn carriage ride. 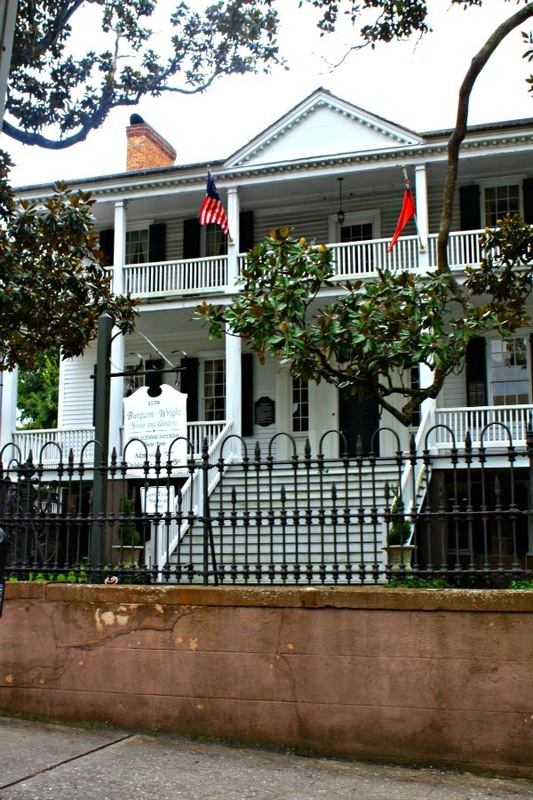 If you are not able to fit a visit to the Cape Fear Museum into your Wilmington visit, the horse-drawn carriage ride is another excellent way to orient yourself and learn about the town's history. 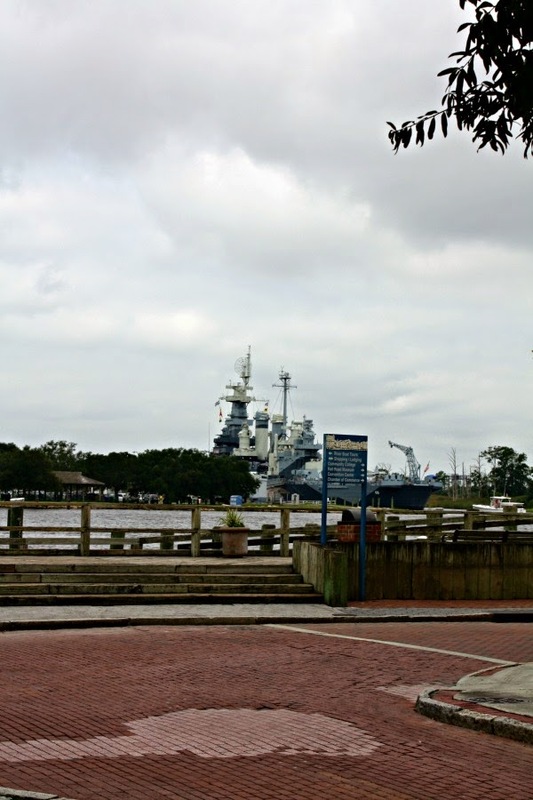 However, both attractions together will give you a very well rounded understanding of Wilmington history. 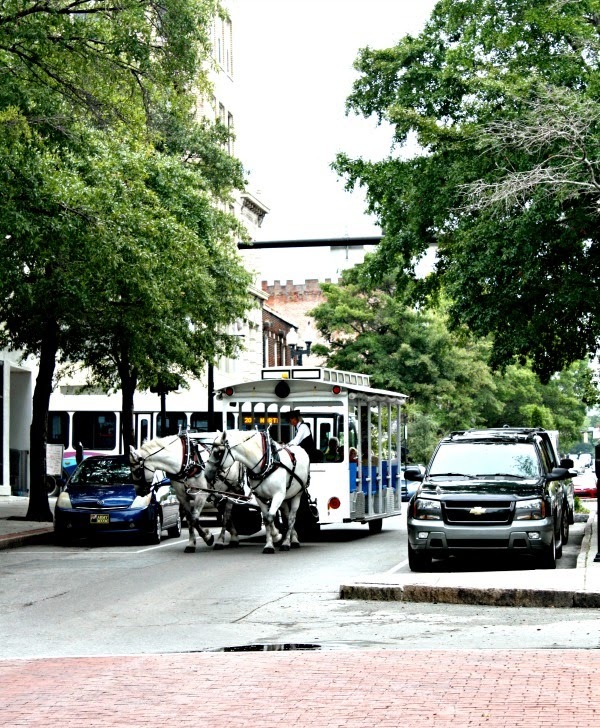 The carriage tours begin down by the Riverwalk, footsteps from the stunning Cape Fear River. We arrived a bit before our carriage, so we were able to wander around a bit. There are many stores and restaurants in the area to peruse including my daughter's personal favorite--Kilwin's for candy or ice cream! Before we could indulge, however, our chariot arrived! Our driver greeted us and began with a brief yet lively introduction about Springbrook Farms, the company that runs the carriage rides. Besides treating visitors to splendid tours of Wilmington, Springbrook rescues horses. The carriage horses are rescued Percheron draft horses that were to be sold off by the Amish. If a Percheron draft horse cannot work at the same pace as other farm horses, the Amish sell them off. Springbrook rescues these horses and trains them to draw carriages. The farm has rescued 16 horses so far. The horses are given breaks throughout the day as well as plenty of water during breaks. We learned that each pair works one week and then has three weeks off at the farm. We were pretty impressed by the initiative Springbrook has shown by rescuing these horses. 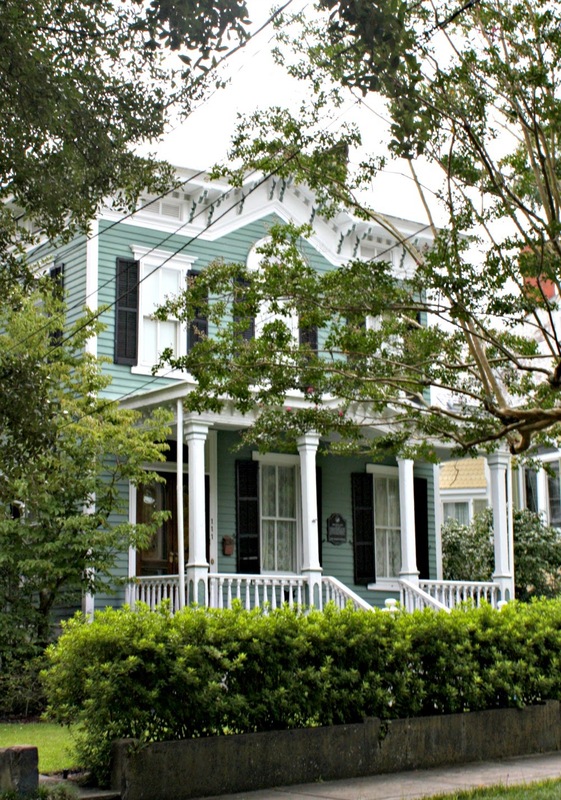 One of many lovely homes in the historic district. The area adjacent to the Riverwalk is bursting with historic buildings. Each is marked with a plaque detailing the year the structure was built as well as a snippet of its history. Our guide was able to give us more details about the important homes and buildings we passed by. The historic district is kept up nicely so the structures were truly a joy to see! 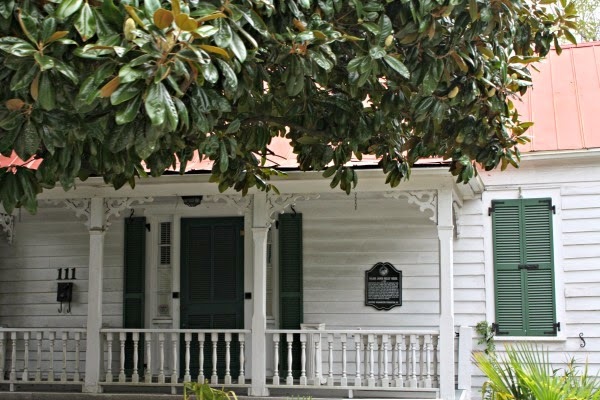 Some of the buildings even date back to the 1700's like the Burgwin-Wright House which once was a headquarters for General Cornwallis during the Revolution. We also saw Major James Reilly's home. Major Reilly was the last Confederate commander of nearby Fort Fisher which we will talk about in a future post. The home of Major James Reilly. 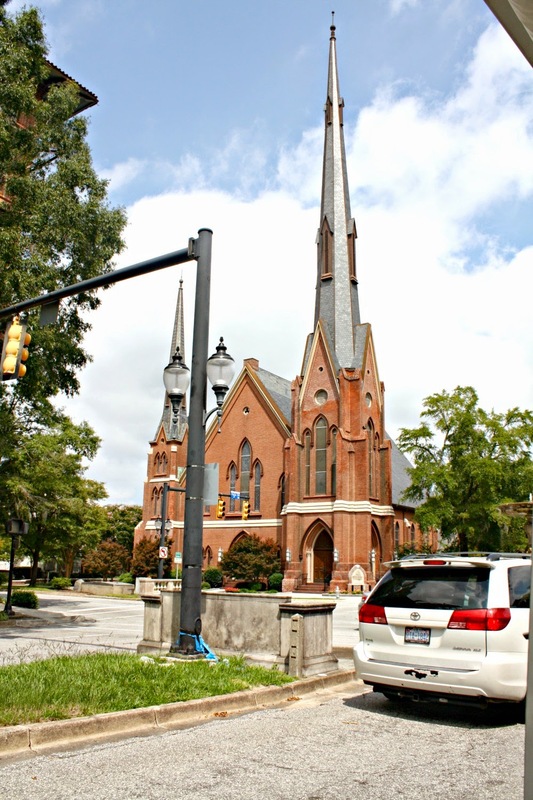 The amazing spires of the First Baptist Church were a site to behold. While we wound through the glorious tree-lined streets of Wilmington, its history unfolded before us. We were amazed by how much we could learn in such a short turn about the historic district! Another advantage--we were already aware of some landmarks before walking through the area in the afternoon. 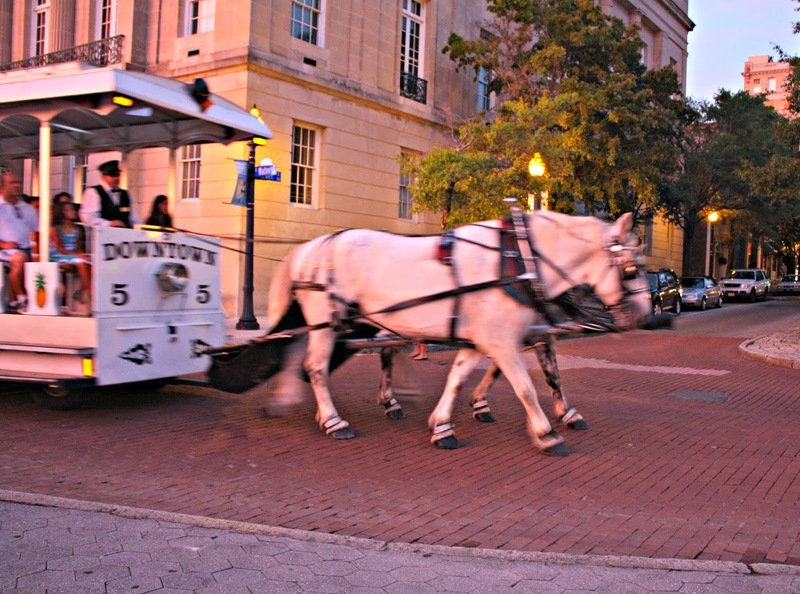 As a testament to the bevy of points of interest in Wilmington, there are 8 different routes for the carriage tour. I cannot think of a better way to wind pleasantly through Wilmington's streets and learn about the people that lived there. With so many tours, you can easily have a couple of different rides and see quite a variety of homes! Of course, our ride was so divine that I would not mind repeating it! A lovely time! Tours last about 30 minutes. However, expect to spend about an hour when you add in time to wait for the carriage to arrive and time for the horses to rest. Tours run 10AM-10PM daily April-October and 10AM-4PM Sun-Thurs and 10AM-10PM Fri-Sat the remainder of the year. Tours are $12 per adult and $5 per child under 12. Wrightsville Beach Magazine has an excellent article about Springbrook Farms for more info on what they do.